Roush has announced their new Phase 2 Supercharger Kit calibrated to deliver 625 horsepower and 525 lb-ft torque to the 2011-2013 Ford Mustang 5.0L V8, an increase of 205-213 HP and 135 FT/LB over stock. Upgrades compared to the standard system include an 85mm supercharger pulley and a cold air induction system with a 110mm MAF and a reusable open element air filter. The supercharger kit is protected by Roush Parts limited warranty (Roush-supplied parts only), which is for 3 years or 36,000 miles from original installation date. The system is not approved for sale or installation in the state of California. Retail pricing is listed at $6,599.99. 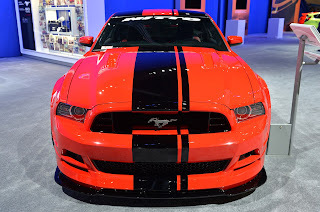 This entry was written by by MustangsDaily (Mustangs Daily) and posted here on Tuesday, August 21st, 2012 at 12:58 pm and is filed under New Products, roush phase 2 supercharger, roush supercharger, roush tvs supercharger. This article was not written by us, rather gathered using RSS feeds listed here. We take no credit for this article. You can leave a response, or trackback from your own site.